On the eve of a Full Moon eclipse, we consider the wonder of these celestial events, the flick of the celestial light switch. We look ahead to the dramatic total solar eclipse on August 21. Visible only across the USA, this rare moment is being called The Great American Eclipse, though its effect reverberates through the whole planet. In addition, the impact of the eclipse is quite profound in the birth chart of the U.S. President. How important is this eclipse to you? Clearly, if you a Leo or Aquarius. Those born 1937-1962 are particularly called in as a generation. This Leo eclipse is aligned with fiery red Mars and the star Regulus, the Heart of Leo the Lion, empowering a shift from masculine to feminine leadership and values. Mythically, the mysterious Sphinx and the bloodthirsty Lion Goddess are called forth. Let’s explore the storyline, the themes and potentials of this eclipse season with its ripple effects into 2018-19, as we prepare to follow our hearts through the transformational dark portal. If you can’t attend live, you will receive a link to watch when convenient. With the powerful August eclipses in Leo, be on the lookout for the Lion Lady. From ancient civilizations the world over, we see images of the Goddess flanked by or riding lions, tigers or leopards. She may be lion-headed or lion-bodied, Sphinx-like. Egyptian Sekhmet is one of the best known, a warrior goddess who wields the power of the Sun. “May the force be with you,” may be an invocation to Sekhmet. Lions guard and protect. When humans break cosmic law, disregarding justice, her wrath is ignited. She is likely to go on a destructive rampage, slaughtering all in her path. Sun god Ra had to pour in her path beer colored with pomegranate juice to assuage her thirst for blood. Yet this Lady of Terror becomes the Lady of Life, for transformation and healing. Today many of us, women and men, recognize that powerful female images have often been demonized. 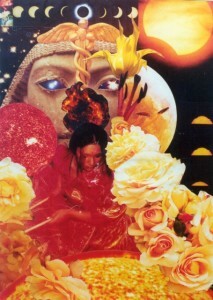 As women reclaim, and men support, inherent female powers as mothers, leaders, healers, protectors, creators and change agents, Sekhmet leads the way to transmute negativity, chaos and terrorism into a powerful life-giving expression—but only when we approach her with respect, honor and caution. She confronts us with our unhealed shadow issues to own, then release, reminding us that to change the world, we must first change ourselves. She steps through the August eclipse as a source of strength, independence and assertiveness to dissolve limiting belief systems, negative habits of thinking and feeling, and ways of living that no longer serve, so that we can create a world culture that supports public wellbeing and empowers individual fulfillment. The eclipse takes place at the cusp of signs Leo and Virgo. Merging the imagery, we find The Sphinx, with the body of a lion and the torso of the goddess. What mysteries does she present? What searching questions does she ask? The royal star Regulus stands by, marking the heart of The Lion. This is a profound call to express your essential Self, to stand forth in the truth of your heart. Do you have the courage?